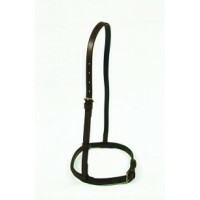 Convert any caveson noseband to hanoverian. 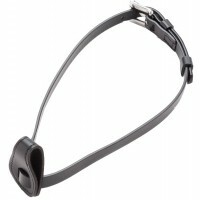 Simply fold the converter over the noseband and thread t..
A quality drum-dyed flat cavesson noseband suitable for any english bridle. 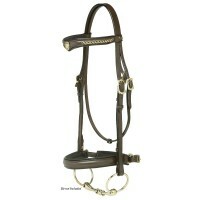 Sizes: Pony, Cob, ..
Hansome snaffle bridle. 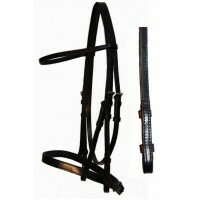 Flat ½" browband and 7/8" noseband. Billet ends have hook studs. 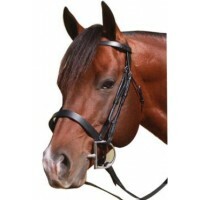 Includes ma..
Black with Silver Hardware • The popular 'V' Browband with shield and beaded chai..
Brown with Brass Hardware • The popular 'V' Browband with shield and beaded chain.• C..
Leather, padded browband and wide padded cavesson noseband. 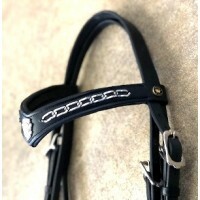 Includes laced billet hook reins. Avail.. 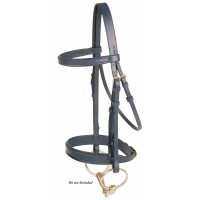 This is a flat bridle for those who want a finer look. Includes reins. 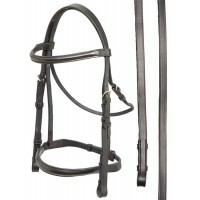 Available Sizes: Pony, ..
Flat noseband and browband - Small Pony only Available Colours: Black or Havana..
Comes with a flat noseband and browband. Drum-dyed leather with matching leather reins. 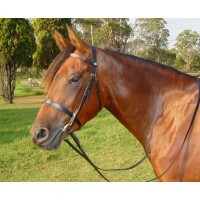 Available S..
Half raised browband and cavesson complete with plain leather hook stud end reins. Leather with Stai..